Templatic Store Front is a premium Wordpress Template to help you create your own online store quick and easy. This eCommerce online store Wordpress theme has plenty of features all which are essentials to have a fully functional eStore and will set you apart from your competitors. 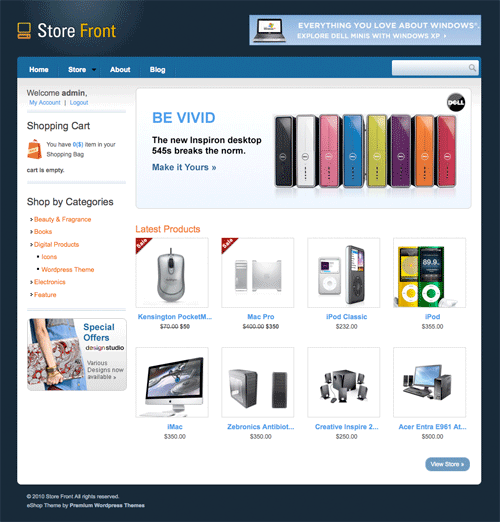 The Store Front features include a flexible shopping cart to sell tangible products to a store to sell digital downloads for movies, software or music. The comprehensive control panel allows you to manage products, prices, coupons, tax, shipping, user registration, payment gateways easily. Click here for more details about the template. Easy one click install. Install and activate the template and it will automatically install sample data. Easily Manage products. You can use bulk upload, edit/add/delete products. Manage orders. You can manage orders by approving, cancelling or rejecting an order. Multiple payment gateways. The theme has PayPal, Authorize.net, Google Checkout, WorldPay, bank transfer and Cash on Delivery as payment gateway options. Choice for people buying from your site to either register on your site before purchase or to access the shopping cart as a guest. Easily manage your shipping costs, tax percentages, coupons. Adsense and banner ads monetized. Templatic provides high quality, completely customizable and premium Wordpress themes. When you install the Templatic theme, it only requires a single click after theme activation to get your sample website look exactly like the same as the live demo. Templatic theme niches include e-commerce, event management, photo blogging, photo gallery, magazine, news, real estate and video blogging themes. Premium Themes and Templates Copyright © 2019.